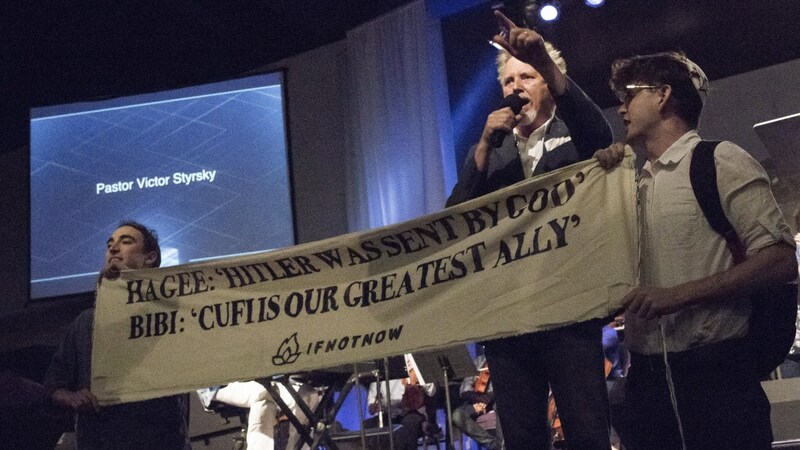 IfNotNow activists Binya Koatz (right) and Adam Hirsch (left) unfurl a banner in front of speaker Victor Styrsky at a CUFI event in Stockton, California, June 2017. Photo courtesy of IfNotNow. REP. ILHAN OMAR recently drew harsh accusations of antisemitism when she tweeted that the American Israel Public Affairs Committee (AIPAC) uses money to influence Congress in support of Israel. The attacks on Omar threatened to drive a wedge between progressive Jews and the freshman Democrat, a black Muslim woman and a newly prominent voice in left politics. With this in mind, many progressive Jewish commentators, including Noah Kulwin in Jewish Currents, have rallied to her defense, arguing that AIPAC does in fact exert powerful influence over the US government’s policy toward Israel. Broadly speaking, this is true. Through the network of wealthy donors and political action committees that donate to the “pro-Israel” candidates it identifies, AIPAC orchestrates sizable financial contributions that go far beyond its official lobbying expenditures and are difficult to systematically track. Presidents, presidential candidates, and congressional leaders from both parties have spoken at recent AIPAC conferences, and the AIPAC-led trip to Israel has become a sacred rite of passage for new members of Congress. The organization has been a key player in securing ongoing military aid for Israel; it also authored the anti-BDS legislation that the Senate passed in early February. But this focus on AIPAC only tells part of the story. Progressives hoping to effectively tackle the US-Israel relationship need to address the broader constellation of interests that drive US policy in the Middle East, including the national security state, defense companies, and the Christian right, all of which deserve similar scrutiny. AIPAC operates within the larger context of the Washington lobbying ecosystem, which includes other major players with a vested interest in shaping US policy toward Israel and the Middle East. Some of them rival or even dwarf AIPAC in funding, connections, or voting base, but nonetheless receive less consistent attention from Israel’s critics on the left. Since Israel’s inception, the US has pursued an alliance for the sake of its own strategic ends. It’s worth noting that in 1947, much of the Washington foreign policy establishment opposed offering American support for the creation of a Jewish state. The concern was that Israel would destabilize the Middle East as a whole and would particularly endanger the US’s relationship with Saudi Arabia, whose oil resources were seen as a critical strategic asset. But once Israel gained independence and emerged as a regional military power, it was soon regarded as “a potential base area” from which the US military could promote economic stability in the Middle East and ensure reliable access to Saudi oil reserves. For the next two decades, American support for Israel remained materially limited, even though its burgeoning role as the dominant Western power in the Middle East had become clear by the early 1960s. But after Israel achieved its surprising victory in the 1967 Six-Day War, Washington began to regard the Jewish state as an effective bulwark against Soviet influence and growing Arab nationalism. When Palestinians revolted against Jordan’s King Abdullah in 1970, the US turned to Israel to prevent Soviet intervention in the crisis. “[T]here are only two of us to stop them,” President Richard Nixon said, “the Israelis or us.” The following year, Congress increased its budget for US military loans to Israel from $30 million to $545 million, a number which has risen steadily over the past several decades. Since that time, the US has maintained “stability” in the Middle East by supporting brutal, authoritarian, pro-business regimes in Egypt, Saudi Arabia, and elsewhere that repress human rights and democratic politics. At the same time, the US has employed active military intervention—ranging from coups to drone bombings to full-scale invasions—to suppress radical Muslim or secular nationalist movements that might be less friendly to American financial and military interests. The US sees Israel as an essentially conservative “force of stability,” far less vulnerable to sudden political shifts than other regional players. Although it enjoys de facto alliances with several US-allied Middle Eastern regimes, Israel is popularly despised throughout the region due to a number of factors—including anger at its treatment of Palestinians, the perception of Israel as a European intruder, and the antisemitic canard of Israel as a global puppetmaster orchestrating Arab suffering. Israel thus remains reliant on American aid, in exchange for which the US is able to project regional influence via Israel’s powerful military and intelligence services. While the Israel lobby encourages and nurtures this strategic relationship, the relationship has a logic of its own, stemming from the self-interested worldview of Washington foreign policy professionals, and predating the role of organizations like AIPAC. The defense industry also exerts immense influence over US policy toward the Middle East for the sake of its own profits. Its interests aren’t always in sync with the Israel lobby, and it gets its way at least as often, while at the same time benefiting from the US-Israel relationship. The industry as a whole spent $64 million on lobbying in 2018. Boeing, the single largest spender, budgeted $15 million for lobbying (for comparison, AIPAC spent $3.5 million on lobbying during the same period). One clear measure of its influence: a former Boeing executive, Patrick M. Shanahan, currently serves as the Acting Secretary of Defense. In 2015, the company hired a lobbying firm to promote the Obama administration’s proposed nuclear deal with Iran, which AIPAC and the Israeli government vehemently opposed, and it quietly paid Thomas Pickering, former ambassador to Israel and the United Nations, to testify before Congress on behalf of the deal. The incentives were substantial: when the deal passed, Boeing carried out a $25 billion sale of its airplanes to Iran Air. Boeing also directly profits from US military aid to Israel. It grew to rely on that source of revenue during the Obama administration, which increased military aid to Israel in order to offset Israel’s concerns about the Iran deal and mollify the defense industry’s concerns about the administration’s decline in direct military spending. In 2016, Boeing and other defense industry firms—again despite AIPAC’s best efforts—successfully persuaded the Obama administration to phase in a requirement that Israel spend all of its 10-year, $38 billion aid package on weapons made in the US. This came at the expense of the Israeli defense industry, which had previously benefited from weapons sales funded by the US aid package. Boeing then turned around and negotiated a projected $10 billion in arms sales to Israel. Progressives concerned about US military support for Israel must move beyond a narrow focus on AIPAC, which not only leaves an important conversation vulnerable to accusations of antisemitism, but is fundamentally incomplete. A more comprehensive approach can assuage Jewish concerns about antisemitism and sharpen left analysis around US foreign policy regarding Israel by emphasizing the larger network of financial and strategic interests sustaining the US-Israel relationship. It would also link Israel/Palestine to other important progressive concerns, from bloated Pentagon budgets to US support of autocratic regimes to the political dominance of the Christian right. In the same week that Rep. Omar was attacked for her focus on AIPAC, she also grilled Elliott Abrams, Trump’s new special envoy to Venezuela, about his role in orchestrating and covering up horrific Reagan-era human rights abuses in Central America. Abrams is also a longtime supporter of Israel and of US interventions in the Middle East. Supporting Israel is, after all, only one facet of America’s strategy to promote its global interests, often at great cost to vulnerable populations across the world. Omar was drawing attention to this larger context, which might explain why Washington is so afraid of her.